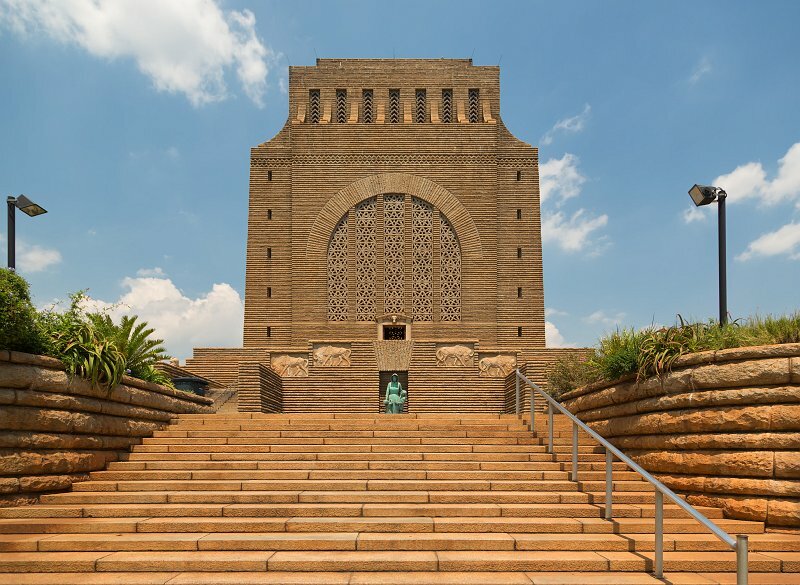 The Voortrekker Monument is located just south of Pretoria. This massive granite structure is prominently located on a hilltop, and was raised to commemorate the Voortrekkers who left the Cape Colony between 1835 and 1854. The cornerstone was laid, on 16 Dec 1938, by three descendants of the Voortrekker leaders. The Monument was inaugurated on 16 Dec 1949. The Voortrekker Monument is 40m high, with a base of 40m by 40m. The building shares architectural resemblance with European monuments but also contains African influences. The two main points of interest inside the building are the Historical Frieze and the Cenotaph.